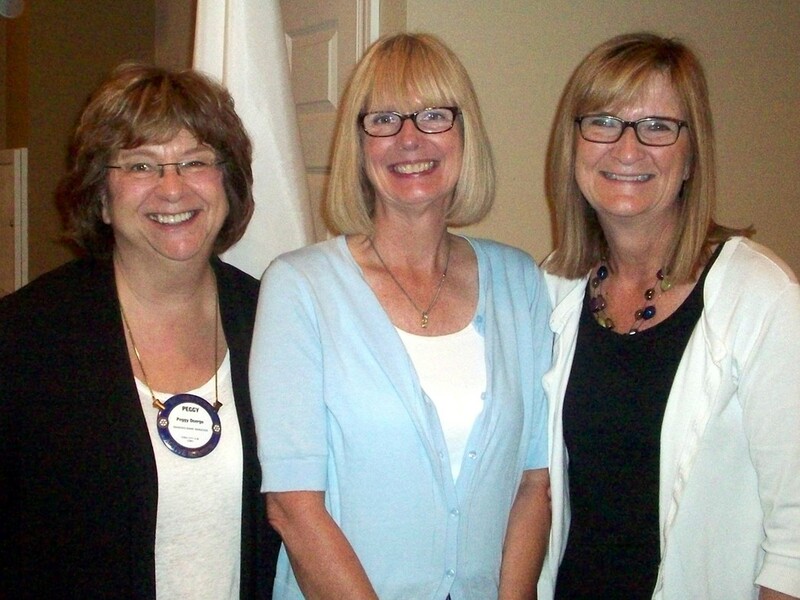 Rotary File for June 9, 2015 | Rotary Club of Iowa City A.M. The Speaker was Dawn Oliver Wiand, Executive Director of the Iowa Women's Foundation. Dr. Meszaros introduced herself. She is a medical doctor from Chili who is staying with the Schultz family during the month of June. John Schultz indicated that Catalina would be happy to spend some time during the next couple weeks with others from the Club. Just let John or Rebecca know if you would like to share some activity with their guest. Dr. Meszaros is not here because of Rotary, but is appreciative of all the support she is receiving from Rotarians in order to fulfill her dream of visiting people-to-people in the U.S.
Karin Franklin noted that there are FAMSCO work days scheduled 6/14 and 6/28 to complete the work of packing up everything in the warehouse near Theisens in Coralville in order to make sure everything can either be moved or shipped by 6/30. Nenu Piragine is working on arranging a shipment of supplies to Paraguay. Jim Peterson announced that he and Nenu would be visiting the location of the Rotary water project in Paraguay next week. Sue Cronin reminded members to sign up for the Year Ender which will be held in the evening of June 30 from 6-8 at the Northridge Pavilion in Coralville in place of a morning meeting that day. Please pay in advance the $25 per person cost and remember to BYOB. The food is being catered by Valerie Martin. Mark Patton encouraged Club members donate to the new endowment fund through the Johnson County Foundation. The match of Casey Cook's first $5000 contribution is ongoing. Liz Loeb survived her family reunion. John Schultz celebrated the recital of one of his 14 year-old students and noted that this student has donated all proceeds from the event to charity. She is starting young with Service Above Self! Hazel Seaba contributed several bucks in celebration of her birthday the fact that she got to spend her birthday having a lovely time at the Janesville WI Rotary Garden. Margy Winkler and her spouse survived his first day of retirement on Monday. Jim Peterson is happy that he is off to Paraguay to see the water project with Nenu. Casey was unhappy about losing a dental cap, but glad that it happened before his summer trip and not during the trip. Peggy Doerge introduced Dawn Oliver Wiand, the Executive Director of the Iowa Women's Foundation. The purpose of the IWF is to support research and programs that are designed to help women and girls in Iowa to become more economically self-sufficient. By uplifting the economic lives of women in the state the Foundation is also helping to positively impact families and ultimately all Iowa communities. Wiand started with a number of disconcerting statistics: 70% of Iowa women are struggling economically and 40% of those women live below the poverty level. 75% of elderly women are poor, and yet 82% of these women were not poor until widowhood. 77% of Iowa women make less than men in comparable jobs, and that number is down 2% from just a couple years ago. 97% of the women-owned businesses make less than $250,000 per year. Yet when women do make gains economically it has been shown that they reinvest 90% of what they make in goods and services that flow back into the community. That is why boosting the economic strength of women in the state contributes so much to overall well-being. The IWF was founded by a core group of 27 women in 1994. It has been continuing to expand its influence from a base in Iowa City and eastern Iowa to state-wide. There are 5 key strategies at work in everything the IWF does: research; awarding grants; advocacy; education and collaboration. Wiand gave examples of how IWF plays an important role in the economic outlook of Iowa women through each of these strategies. Since 2011 there have been three research reports in the "She Matters" series. Wiand is taking a fact-finding mission to 18 communities around the state to explore actionable plans with the latest 2015 update of "She Matters." In grant awards the applications are up from 38 just a year ago with asks for $200,000 to 72 this year with total requests of $500,000. The requests impact virtually all 99 counties and come from a wide variety of women's and girl's groups and individuals of all ages. Many of the projects funded in the past have had far-reaching impacts. The educational component is largely focused on providing educational policy makers and leaders with the information they need to make wise decisions that will improve the economic outcome for women in the state. She cited as an example decisions concerning child care reimbursement policies and decisions regarding bus schedules and routes in various communities to open better paying jobs to women with limited transportation. Wiand said that the IWF and its current leadership cannot do the job alone. She encouraged each member of the club to tell at least 3 other people about what they learned in today's presentation.